The performance factors that EDMers look for are metal removal rate, wear, surface finish, machinability, and material cost. A large cavity with no detail would typically require a material that would provide a high metal removal rate, good wear, and be available in a large size at a reasonable cost. These performance factors would be found in a grade in the Fine classification where particle size is larger and the material is economical. At the other extreme, a very small cavity with razor sharp detail would typically require a grade in the Angstrofine classification where a good surface finish, very good wear resistance, and machinability are critical. The small particle size and high strength give this grade the ability to hold and maintain intricate detail. The material cost would be an insignificant factor. Each application will have different performance requirements that should be considered when selecting a grade. Job factors to be considered are the workmetal, the shape, size and number of cavities to be cut, and the number of electrodes needed to rough and finish the job. The performance factors can mean the difference between success and failure, profit and loss. These factors, together with the graphs from the Objective Comparison Testing program will provide an accurate evaluation of a given material's performance. Metal removal rate is usually expressed as cubic inches per hour (in3/hr), but in fact could just as realistically be expressed as $/hr. In the workpiece — MRR is influenced by the physical properties of the workpiece material. The melting point and the thermal conductivity of the workpiece are important. Copper, as an example, has a low melting point, but the metal removal is still generally low. This is due to copper being a good thermal conductor. This means heat is dissipated too quickly and therefore interferes with efficient metal removal. 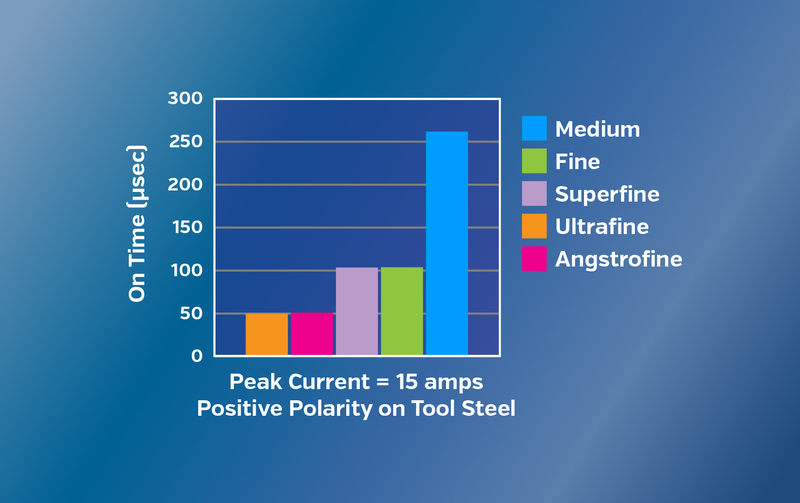 Tool steel, on the other hand, has a higher melting point, but is not as good a thermal conductor and therefore has better metal removal rates than copper. 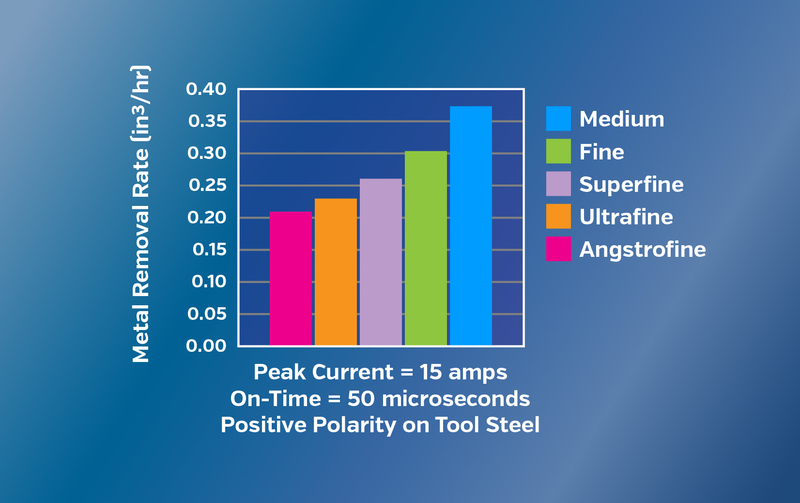 It is important to consider both properties of the workmetal when evaluating EDM performance (figure 6-1). 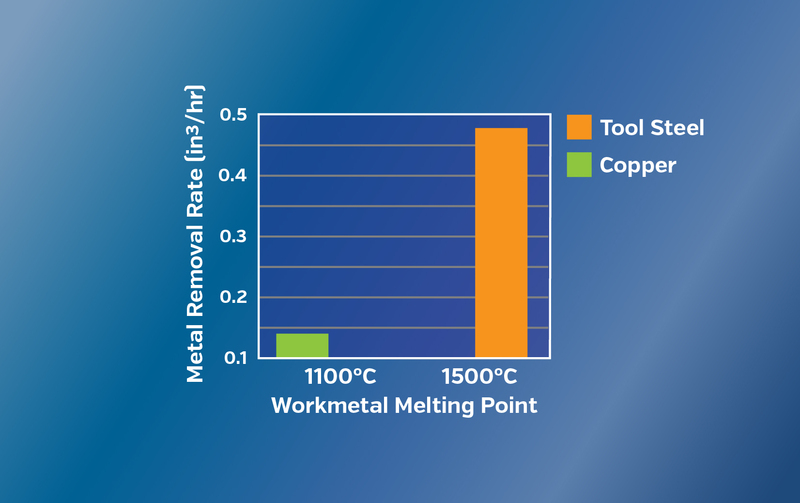 Figure 6—1 Because copper is a good thermal conductor the energy dissipates in the workmetal giving a really low metal removal rate. 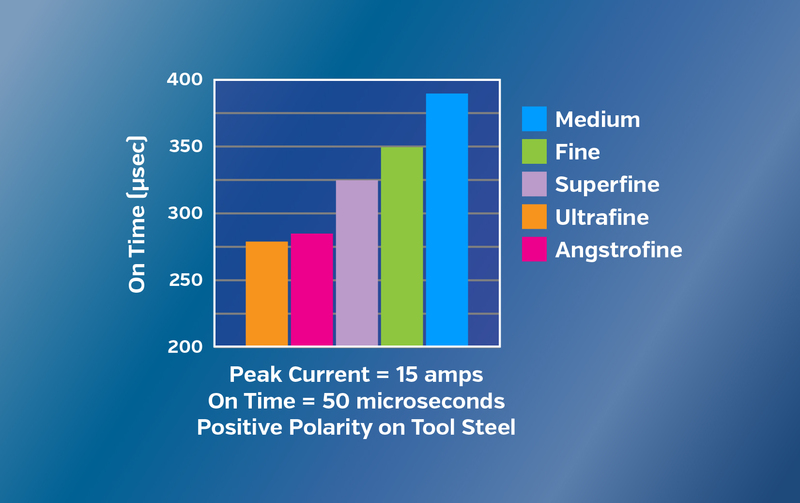 Tool steel is a poor thermal conductor and gives a much higher metal removal rate. In the gap — Particles of the electrode material in the work gap will contribute to instability and energy could be dissipated in the gap. This will slow down the metal removal process. In the electrode — The machine may run smoothly while consuming as much electrode as workpiece. Electrode erosion cannot be completely eliminated, but it can be minimized by choosing the proper electrode material/workmetal combination and machining at the optimum settings. Obviously, energy dissipated anywhere but in the workpiece is wasted and the greatest and most controllable losses are those which occur in the electrode. Generally, when cutting in positive polarity, the larger the particle size of the graphite electrode the faster the electrode will cut through the work metal. Figure 6-2 compares the metal removal rate of the five EDM classifications of graphite under one set of conditions. However, speed is not usually the only consideration when cutting cavities. As the amount of detail increases, the particle size of the graphite needs to decrease. Figure 6-2. Typical metal removal rate comparisons for EDM graphites. There are four different types of wear: volumetric, corner, end, and side (figure 6-3). Corner wear is usually the most important since it will determine the degree of accuracy of the final cut. If an electrode can successfully resist erosion at its most vulnerable points, then overall wear will be minimized and maximum electrode life achieved. The ability of an electrode material to produce and maintain detail is directly related to its resistance to wear and its machinability. Corner wear is also important if the electrode is to be dressed. The electrode will have to be dressed back beyond this worn area. 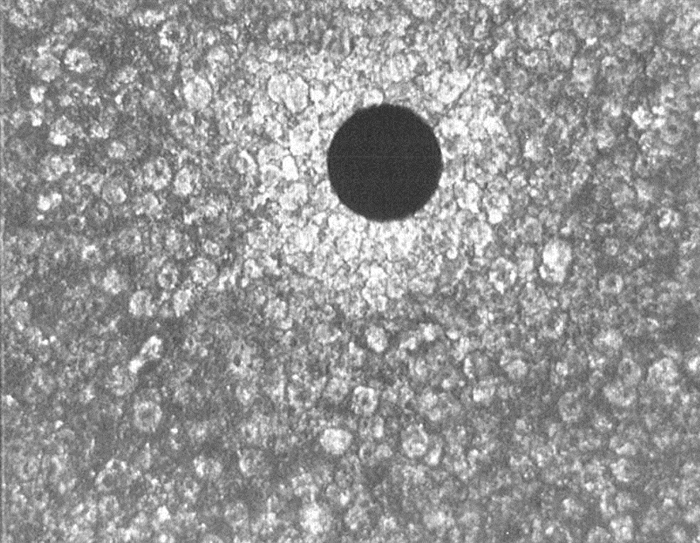 End wear — This is the reduction in the length of the electrode during the EDM process. The amount can be calculated by measuring the length of the electrode before the cut and after the cut and subtracting the length after the cut from the original length. 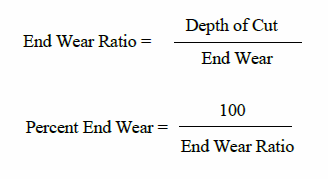 End wear ratio — The end wear ratio (work/wear) can be expressed as a percentage of the original usable length of the electrode. The depth of the machined cut in the workpiece is divided by the measured end wear. Dividing this number into 100 will result in the percentage of end wear. Corner wear — Electromagnetic fields tend to concentrate at the electrode corners (figure 6 /1), subjecting the corners to greater wear. The sharper the angle, the more sparks are generated in this area and the more heat buildup. This causes accelerated wear in the corner areas of the electrode. Blunt corners will wear less than sharp angle corners. Corner wear can be minimized by choosing a small particle size electrode material that has high strength and high density. Figure 6-4. Electromagnetic fields tend to concentrate at the corners. Corner wear is determined by first getting an apparent corner wear reading. This is done by measuring the electrode on an optical comparator. The apparent corner wear is the length lost at the 90° angle. True corner wear is then obtained by adding the amount of end wear to the apparent corner wear. Corner wear ratio — A corner wear ratio may then be calculated by dividing the depth of the cut by the true corner wear. Side wear — This is wear along the side walls of the electrode. Side wear is caused by particles which have been flushed out of the cutting gap. As these particles are carried along by the dielectric they can mechanically abrade the sides of the electrode. If there is excessive particle movement in this area, sparks will occasionally jump the side gap, producing cutting between the side of the electrode and the workpiece. The bridging of the gap can be caused by poor flushing conditions, large particles or excessive particles. 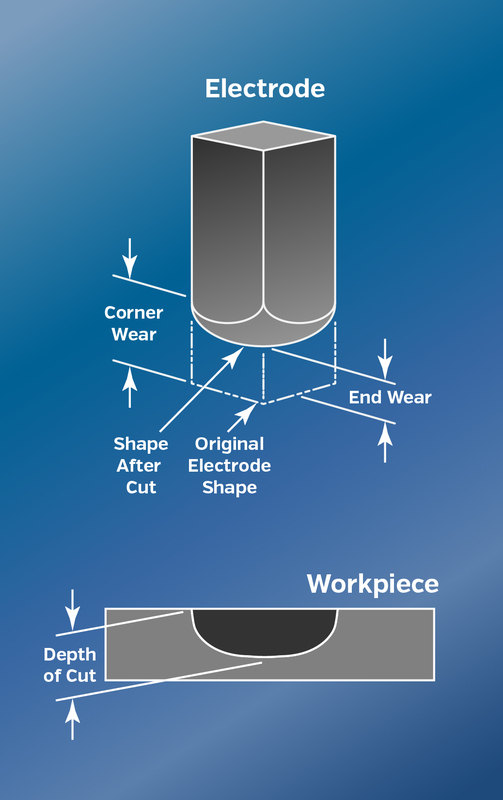 Side wear causes the cut to taper in as the electrode moves through the workpiece. The amount of taper is determined by measuring the bottom of the cut and subtracting it from the top of the cut. Orbiting the electrode causes the entire surface of the electrode to be used, instead of the end. As the electrode moves sideways, it cuts the side walls. Due to the larger electrode area involved in the cutting process, machining current can be increased to improve metal removal rate. Electrode orbiting greatly reduces side wall taper of the workpiece (figure 6-5). Figure 6-5. Comparison of orbiting and non-orbiting electrode side wear. The non-orbiting electrode wears more at the end and corners while the cavity side walls taper. 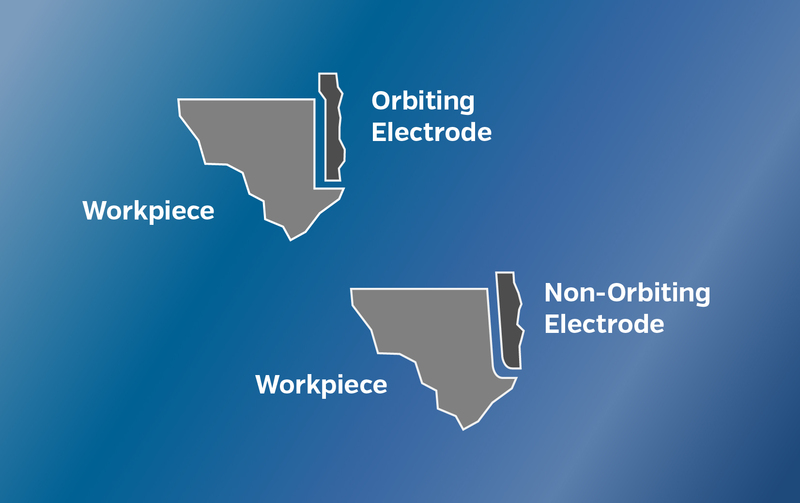 Orbiting electrodes wear evenly along the side and end producing straighter side walls in the cavity. Generally, graphite with small particles and high strength will wear slower than graphites with large particles (figure 6-6). No-wear conditions (less than 1% end wear) can be achieved in some workmetals with electrode materials in all classifications using the optimum setting for each material. Figure 6-6. Typical end wear for the different graphite classifications. No-wear EDMing is considered to be 1% or less electrode wear. 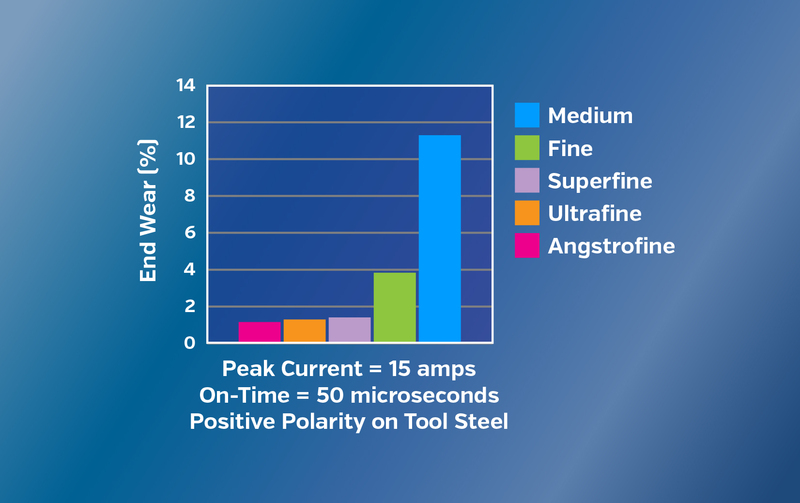 Parameters necessary for a no-wear condition with graphite electrodes is positive polarity and long on-times. The off-time is set as short as possible to maintain stable machining conditions. During a no-wear situation the electrode will take on a silvery coating that is the effect of the workmetal plating the electrode. Too much plating action will cause the electrode to grow. Nodules may form on the end of the electrode and distort the shape of the electrode (figure 6-7). Figure 6-7. Excessive plating action caused this electrode to form nodules. No-wear settings do not produce the fastest metal removal rates. Although it is possible to obtain no-wear conditions with graphite from any of the five classifications, not all electrode/workmetal combinations can be put in a no-wear condition. Figure 6-8 shows the approximate minimum on-time required to achieve a no-wear condition for each class of graphite. Figure 6-8. No-wear comparisons for different graphite classifications. Surface finish can be controlled by a combination of factors, such as on-time, peak current, the electrode material, and the workpiece material. As the electrode progresses during the machining cycle, it will produce a reverse image of whatever shape or form it possesses. Imperfections in the electrode surface will also be reproduced in the workpiece surface. This includes particulate loss caused by wear or material loss caused by high temperatures. If the electrode is pitted, it will show up on the workpiece. The final surface finish will be a mirror image of the electrodes’ surface. Short on-times and low peak current settings produce the best finish, as these conditions produce smaller craters in the work metal. Until these conditions are met, no electrode material will produce a fine surface finish. 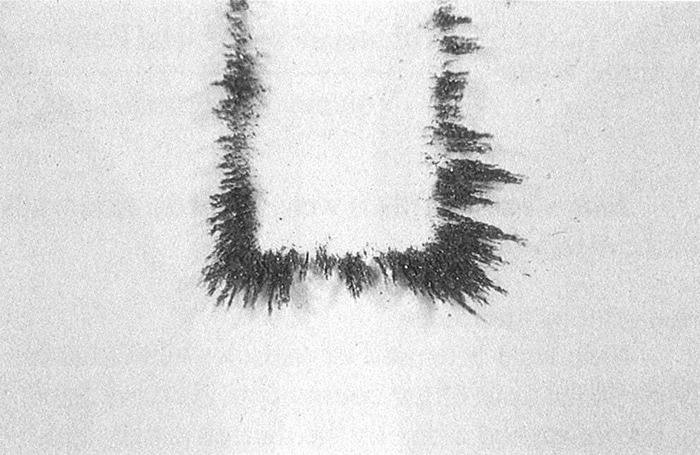 Angstrofine and Ultrafine graphites with high strength and small particles are the best choices for finishing electrodes (figure 6-9). Figure 6-9. 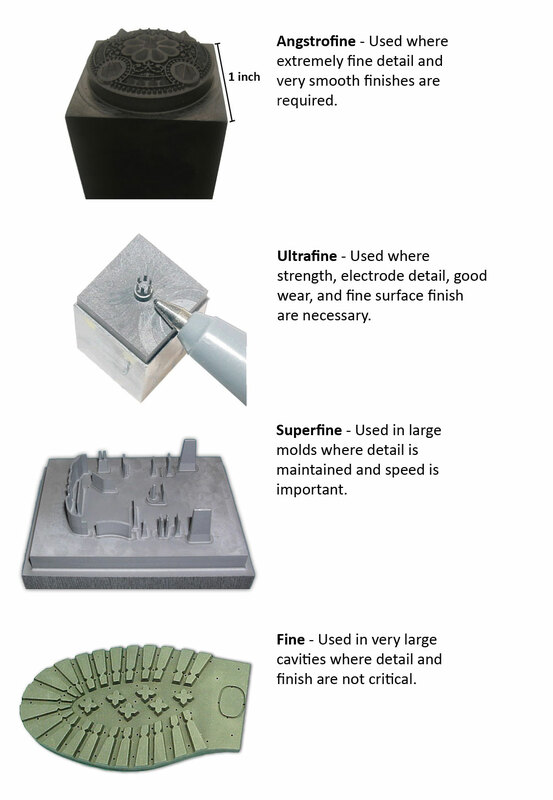 Typical surface finishes for different classifications of graphite. Finer surface finishes can be obtained with an orbiting electrode. As the electrode moves out through its orbiting pattern, the machine can be programmed to continually reduce the amperage. This can produce a very fine finish with a smaller recast layer. The American standard for measuring finish is Ra (arithmetic average) and can be expressed in micro inches or micro meters. The European standard is VDI. RMS (root mean square) is obsolete, but still found in some publications. The following table compares these three methods of measuring surface finish. Most graphites are easily machined. Materials with high hardness values can cause machining problems. The fabricating time is influenced by the particle size and strength of the material along with the desired electrode detail. The maximum detail that may be obtained in graphite is limited by the material strength, particle and pore size. Machining time can be wasted by trying to machine in more detail than the material can handle. The resulting high scrap rates are due to chips and breaks. Minimum radii and close tolerances can be better machined from high-strength, small particle materials, and the resulting electrode will maintain that detail longer. Vanes 0.020" thick and over 1.0" high with flush holes 0.005" diameter are attainable with Angstrofine and Ultrafine class graphites. Roughing or large electrodes with little detail are easily machined from graphites in the Superfine and Fine classifications (figure 6-10). Electrode fabrication, wear, and redressing costs should be weighed to determine the best electrode material and machine settings. The actual material cost represents only a small part of the total EDM job cost. Many of the commonly encountered graphites sold as EDM electrode materials are very cost effective performers for roughing out cavities where finish and detail are not important. However, they can become very expensive indeed when applied to the wrong job. Each application will have different performance requirements that should be considered when selecting an electrode material. Job factors to be considered are the work metal, the shape, size, and number of cavities to be cut, and the number of electrodes needed to rough and finish the job. The selected electrode material affects the fabrication time, cutting time, labor, and electrode wear. That is why it is critical to understand the properties and characteristics of the graphite grades and how they perform with the workmetal to be machined. These factors can make the difference between profit and loss, success and failure.